Eight years ago, Silk and I were here in Japan during the horrific triple disaster that hit the country. In a matter of minutes, lives were ruined, the country was disrupted and it was a day that none of us will ever forget. The spirit of "Ganbatte" — never giving up or it’s similar "Ganbare" – let’s do our best or together carried the nation through the deep personal and societal loss. It was a significant time for the body of Christ in Japan, as Christ’s Church rose to the occasion to help bring hope and healing to the nation. It was one of the most unifying expressions in modern Japanese church history and the hope that it inspired is still active today. 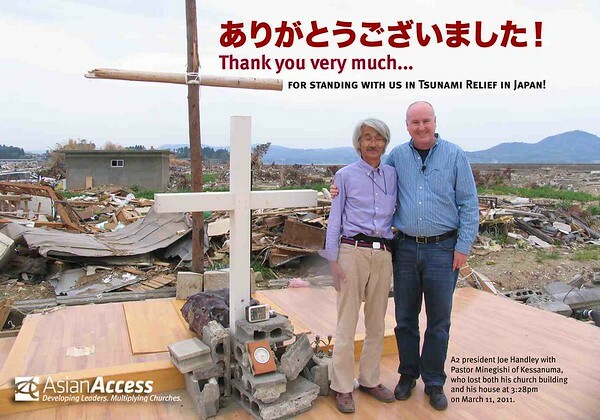 To get a glimpse of how this happened, take a look at this Lausanne article about the Japanese believers: The Story of an Earthquake and the Christians Who Stayed. It’s a beautiful example of the hope that Jesus offers our world. You might like to know that a few in the article are colleagues of mine with Asian Access. This “Ganbare” Spirit continues to this day. Several Japanese Christian Leaders are casting a vision to double the Christian population over the next several years and eventually see 50,000 churches planted across the nation. They hope to see this year’s Rugby World Cup and next year’s Summer Olympics as catalysts toward the larger vision. This past week, I hosted the Jesus Film here which is looking to join the effort. We met with key church leaders, the Japanese International Sports Partnership (JISP), the Billy Graham Association, the Alpha Course, and many others talking about how we can work together to see this vision come to reality. During the upcoming games, the JISP is planning to have 500 festivals in every province of the country reaching 1,000,000 people. And that is just the beginning. All of this is being pursued with this spirit of cooperation to see God do a mighty work here in Japan. As I look back on the horrible disaster and the lives that were so deeply hurt, and the pain it inflicted on this nation, I am mournful for the magnitude of loss. At the same time, I stand with the Japanese people saying “Ganbatte” and look at what has happened as we came together to bring hope and healing. Pray for Japan today as she mourns the losses that occurred that fateful day. And, pray for a spirit of ‘Ganbare” as we look to be agents of hope in the future. May we see many come to know the hope of Jesus over these next several years. May the upcoming games of 2019 and 2020 truly be catalytic for the Gospel in Japan and may we see the number of believers double in the next several years.